signia fun -p Provides superior sound quality with low distortion 2. Highly advanced feedback cancellation system3. 100% digital signal processing chip 4. Microphone background noise abatement5. Push button hearing mode selection 6. Uses Size 675 Zinc Air Batteries7. Excellent feedback elimination system 8. Computer control, without manual9. Ready-To-Wear New robust design 10. Mini Size11. Moisture-Resistant 12. Rocker volume control13. For use in either ear 14. Includes 2 ear tips (sizes: small large)15.6 Channel 4 programsDisclamer! According to the FDA, it is in your best health interest to obtain a professional medical evaluation before purchasing a hearing aid and you are encouraged to do so before bidding on this item. If you choose to not obtain a medical evaluation before purchasing this item, I am required by law to provide to you and obtain from you a signed written waiver of the medical evaluation, and I am required to provide to you a copy of the User Instruction Brochure for a hearing aid, review the contents of that brochure with you, and afford you time to read the brochure. You must provide to me either a signed statement from a physician or a signed waiver before I will deliver this item to you. 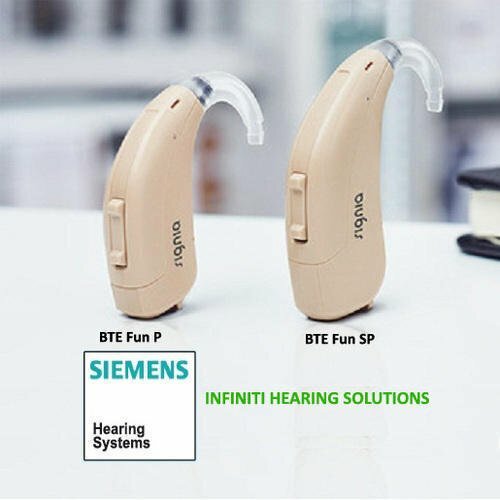 Upon your request, I will also provide to you a copy of the User Instructional Brochure for the hearing aid or the name and address of the manufacturer or distributor from whom a User Instructional Brochure for the hearing aid can be obtained. (1) Microphone-Picks up sound and improves speech understanding in noise. 2) Rocker switchLets you set the suitable sound profile in the fitting process and wearers adjust the volume when necessary. (4) Earhook-Ergonomically formed for greater comfort and a high degree of amplification. (6) Simple Coupling-This simple and reliable kind of sound transmission ensures optimum amplification for all levels.